The simple brilliance of a checklist. Re-reading Atul Gawande's New Yorker essay, I had an idea how to use checklists at school to make our work better and perhaps shift more attention to caring for students. This is a small school for at-risk students who need additional care because they receive too little elsewhere. Almost anything is worth trying, but I'm not going to suggest my idea. I must be some kind of terrible employee, eh? School culture matters and is dictated from the top. In the classroom, I'm the leader responsible for crafting culture. I start by considering each student to be worthy of kindness and inclusion. I temper that with continual judgment based on observation. Most of my work is helping students be more kind. I do that work through writing, reading, and discussion, but it's kindness, compassion, and understanding I teach as much as literacy. A culture of kindness is the starting point from which we can learn. 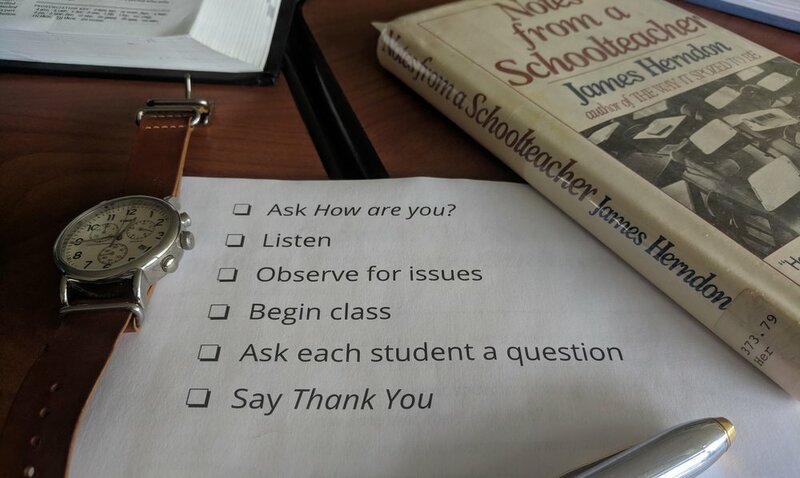 To create that culture, I'm kind to students. I'm not all lovey-dovey, but I work to be thoughtful. I hold a firm line for our behavior. I accept who we are but not everything that each of us does. When they transgress, I talk with them about it, I try to help them see the problem and move them to new ways of doing things. Sometimes I resort to straight-on discipline (referrals and requests for suspension), but mostly, I work to get them to buy into the culture we need. I rarely yell at students or call them out before others. My talks are short and usually quiet rather than lectures or tirades. I never say "because I said so" or "because I'm the teacher." I try to listen to their explanations and thoughts about what they are doing and have done. I answer questions as honestly and completely as I can. All of this to establish a culture in which people are honest, thoughtful, and don't try to solve things through fighting. I've tried setting up all sorts of rules. No phones. No hats. No swearing. But my rule-making created bad culture. Instead, I model my classroom on the culture my wife and I create in our home for our children. Many people who hear I have two teenage daughters tell me how tough it must be. Nope, I say. Well then, just wait, I'm told. I nod and shrug as I move away from those people. They don't understand the culture of our home. Last night, after dinner, I asked the girls to scoop the litter box, dry dishes I was washing, and start the dishwasher. They obliged without complaint. Today they will vacuum the den and sweep the bathroom. When I asked, they said, no problem. Why was this so easy? It wasn't because I'd be angry if they argued. It wasn't because we pay them for these jobs. It wasn't because they're perfect children, though they are quite wonderful. It was because of the culture. When my older daughter is done with swim, she texts us. I often reply that I'm already in the parking lot reading my book. She knows I'll be there for her. My younger daughter often asks if we will give her friends rides home from school. We always say yes. It makes her happy and provides additional time with friends. Why not say yes? That's our culture. Our kids say yes to tasks around the house knowing this is how we do things. We all ask for what we need and give what we can. It's not sainthood but it is a culture of understanding and kindness established before they were born. My wife and I have always worked this way. In the classroom, I replicate most of this. A kid comes in too tired to keep her head up and I find her a quiet place to sleep. I tell her she'll get a lousy grade for class participation that day, but it's no big deal. She will feel better the next day. Sometimes I have her put her head down on the desk. The crazy thing: the rest of the class quiets to let her sleep. That's culture. If I have ideas from Atul Gawande about how to improve the school culture, why keep them to myself. Of course it's the culture. Culture is dictated from the top and yesterday I received clear instruction from the administration about our culture. If I try to impose my will in the classroom by yelling or ordering, we have more conflict and do less learning. Yelling at students leads them to mistrust me. It makes us adversaries or even enemies. It creates a culture of fear and loathing. If I yell and demand at home, those warnings about teenagers come true. My kids will sneak out, tell me to go to hell, and worse. Even if the cat litter still gets scooped and the dishes are still dried, it will all feel wrong. Thee culture would be one in which I don't want to live. The school culture is clear to me. From 7:30 in the morning until 2:45 in the afternoon, 186 days a year, I live in that culture and am to accept it quietly. Within that larger culture I create a classroom culture that best serves students and my skills. And we keep the door closed.